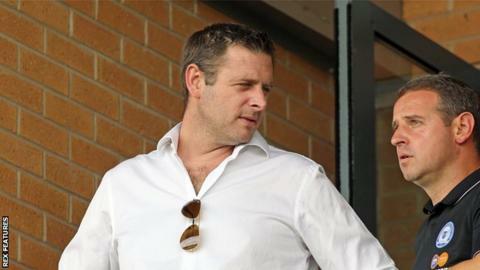 Peterborough United chairman Darragh MacAnthony says everyone's job is under scrutiny until the end of the season. Posh's defeat against Rochdale last Saturday left them 14th in the League One table, after having hopes of a play-off place in February. "It's been awful. It's been well and truly awful," MacAnthony told BBC Radio Cambridgeshire. "For the money I put in, it's nowhere near good enough. People are going to feel that wrath very soon." Posh's play-off ambitions were wrecked by a run of six defeats in seven games between February and March, and despite responding with three wins in a row, losses at Fleetwood and at home to Rochdale have left them 14 points outside the top six. "It's nine years now I've been at the football club," MacAnthony continued. "I can't even remember last year's league position, that's how bad it was for me personally thinking about it, and obviously this year we're 14th or 15th. "I didn't even look last time. It's not that I don't care, it's just I've got no intentions of looking at the table when we're not where we want to be, which is challenging for promotion." Peterborough's season went into serious decline after losing to Premier League club West Brom on penalties in an FA Cup fourth-round replay on 10 February. "The capitulation we've seen since doing well in the league and in the FA Cup, it's been horrific. It's been horrible for me and our fans - I'm an angry man and that anger is going to be felt in the coming months. "It's easy to say we're not going to be in this position again. Some of the fans are losing faith when I say things like that, but I promise everybody wholeheartedly this isn't going to happen again. "I'm done with capitulations. I'm done with the choking and the underperformances of the last two years." MacAnthony is also concerned about a downturn in the numbers coming through the turnstiles. "You cannot take what people say on social media seriously all the time, but you have to listen to your supporter base," he said. "When we beat Crawley last year we had nearly 6,000 people. Our last home gates were around 4,500 people, so people are voting with their feet and wallets. "We're feeling it now on the season tickets. It's hurting the club and it's hurting me." Graham Westley is Peterborough's seventh boss since MacAnthony arrived - predecessor Darren Ferguson had two spells in charge - and knows his position could be under threat. "I employ over 300 people at Peterborough United, not one of those employees right now has a job in the summer," the chairman said. "Every single person who works for me at that football club from the tea lady to the youth players, I want to see that they mean business for next season, because if I don't see it, they're gone. "I back every manager I have. I bring players into the club, I spend money on a stadium I don't own, I spend money on a training ground. I do nothing but good things for the city and Peterborough United. "Do you know what? I want something in return. I want success and I want it next season. In fact, I demand it. "When you put that kind of money in you do expect the people who work for you to do their jobs properly. It's not my first rodeo. I'm not wrong. I know what I'm talking about."